مخروط‌های آتشفشانی کوه سُم، کوه زا بزرگ و کوه زا کوچک در جنوب خاوری شهرستان بم و شمال باختری آتشفشان بزمان قرار دارند. این مخروط‌ها از نظر زمین‌شناسی متعلق به زون ایران مرکزی و حاشیه جنوب خاوری بلوک لوت هستند. گدازه‌های آنها ترکیب بازالت، اُلیوین‌بازالت، آندزیت و آندزی‎بازالت با بافت غالب تراکیتی دارند. Cr، Ni و تا حدودی Eu درآنها بیانگر ماگماتیسم کالک‌آلکالن وابسته به فرورانش است. از طرفی الگوی نمودارهای عنکبوتی بهنجار شده نسبت به کندریت و گوشته اولیه در آنها نشان می‌دهد که از عناصر خاکی سبک غنی‌شدگی بیشتری نسبت به عناصر خاکی نادر سنگین دارند و مشابه الگوی سنگ‌های وابسته به مناطق فرورانش و سری ماگمایی کالک آلکالن هستند. همچنین ویژگی‌های ژئوشیمیایی چون نسبت بالای La/Yb بین 8/6 تا 07/13، محتوای پایین Rb و برخی از نمودارهای تکتنوماگمایی نشان از تمایل این سنگ‌ها به محیط‌های فرورانش اندکی متمایل به درون صفحه‌ای دارند. ماگمای سازنده سنگ‌های مورد بررسی، نتیجه ذوب بخشی یک منبع گارنت لرزولیتی غنی شده درعمق 100 تا 110 کیلومتری است. چنین به نظر می‌رسد که شکل‌گیری این مخروط‎های آتشفشانی مرتبط با فرورانش صفحه‌ عمان به زیر مکران و وابسته به کمان ماگمایی مکران- چغایی باشد. Kuh-Som, KuhzaBozorg and KuhzaKochak volcanic cones are located in the southeastern of Bam and northwest of Bazman cites. From the perspective geology these cones are belong to the Iranian central zone and south-eastern edge of Lut block. These cones are composed of extrusive igneous rocks such as basalt, olivine basalt, andesite and basaltic andesite, and are predominant trachytic texture. Plagioclase, pyroxene and olivine are main minerals. Pyroclastic deposits, lapilli, tuff, ash and volcanic bombs, along with lava flows are main construction volcanic cones. These volcanoes are monogenitic and limited eruption. Based on type material that construction cone of the volcanoes, it seems they are among between Hawaii to Strambolian volcanoes. These rocks shows enrichment to LILE relative to HREE (Ce / Yb= 33-45) , high ratio Zr / Y (33.4), enrichment to LILE and negative anomaly from Ni, Cr and nearly Eu that reveals these rocks related to Calc-alkaline magmatism. In spider diagrams of trace elements and rare earth elements that normalized to Chondrites and primitive mantle show light rare earth elements enriched more than high rare earth elements and show pattern similar to affiliate subduction zones. Geochemical characteristics such as ratio of La / Yb 8/6 to 7/13, low Rb content with the tectonic setting discrimination diagrams indicate that they are related to subduction environments and low tendency to intapalate zone. Source of magma that formed these volcanoes resulted from melting of a garnet Lherzolite at depth of 100 to 110 Km. Tectonomagmatic diagrams shows these rocks dependence on of continental subduction environments to show slightly into the intraplate zone, so that it seems the volcanic cones of them related to the Makran and Oman subduction and related to Makran- Chaghy magmatic arc. خُلقی، م، 1384- نقشه زمین‌شناسی 100000/ 1جهان آباد، شماره برگه 7845، سازمان زمین‌شناسی و اکتشافات معدنی‌کشور. سلخی، ر.، 1376- آتشفشان‎شناسی و پترولوژی آتشفشان‎های کواترنر گهقان بالا، شمال غرب بزمان، پایان‎نامه کارشناسی ارشد دانشگاه شهید باهنر کرمان . سهندی، م. ر.، پاداشی، م.، 1384- نقشه زمین‌شناسی 100000/1 چهارگوش بزمان، شماره برگه 8045، سازمان زمین‌شناسی و اکتشافات معدنی کشور. سهندی، م. 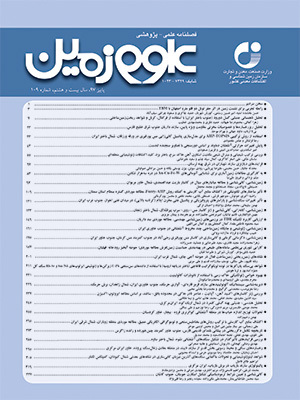 و وحدتی، ف.، 1367- نقشه زمین­شناسی چهارگوش جازموریان (250000/1)، شماره ک 13، سازمان زمین­شناسی و اکتشافات معدنی کشور. قدسی م. ر.، 1384- اکتشافات ژئوشیمیایی سیستماتیک برگه کرمانچی (شمال غرب ایرانشهر)، پایان‎نامه کارشناسی ارشد، دانشگاه شهید بهشتی تهران. قدسی، م. ر.، 1385الف- پترولوژی و پتروگرافی توده‎های نفوذی غرب بزمان، اولین کنفرانس آموزش زمین‌شناسی، دانشگاه تربیت معلم زاهدان. قدسی، م. ر.، 1385ب- معرفی کانی لودویگیت در آهک های دگرگون شده شمال غرب ایرانشهر، همایش انجمن بلورشناسی و کانی شناسی ایران، دانشگاه بیرجند. قدسی، م. ر.، 1395- ژئوشیمی و متالوژنی گرانیتوئید بزمان و سنگ های دگرگونی مرتبط با آن، جنوب شرق ایران، رساله دکتری، دانشگاه سیستان و بلوچستان، 330 ص. قلمقاش، ج.، شیعیان،ک.، عابدینی، م. و مسعودی، ف.، 1393- زمین‌شناسی، ژئوشیمی و پتروژنز آتشفشان بزمان، جنوب خاوری ایران، فصلنامه علوم زمین، سازمان زمین‌شناسی و اکتشافات معدنی کشور، بهار94، سال بیست وچهارم، شماره95، صص. 99 تا 110. وحدتی، ف. و جرجندی، م.، 1383- نقشه زمین‌شناسی 100000/1 چهارگوش مکسان، شماره برگه 7945، سازمان زمین‌شناسی و اکتشافات معدنی کشور. وحدتی، ف.، 1367- نقشه زمین­شناسی چهارگوش جازموریان (250000/1)، شماره ک 13، سازمان زمین­شناسی و اکتشافات معدنی کشور. Aldanmaz, E., Pearce, J. A., Thirlwall, M. F. and Mitchell, J. G., 2000- Petrogenetic evolution of late Cenozoic, post-collision volcanism in western Anatolia, Turkey. Jornal of Volcannology and Geothermal Research. 102: 67– 95. Altunkaynak, S. and Genç, S. C., 2008- Petrogenesis and time-progressive evolution of the Cenozoic continental volcanism in the Biga Peninsula, NW Anatolia (Turkey), Lithos 102, 316-340. Berberian, F. and Berberian, M., 1982- Tectono-plutonic episodes in Iran. In: (Gupta, H.K. and Delaney, F.M., eds) Zagros, Hindu Kush, Himalaya Geodynamic Evolution. American Geophysical Union, geodynamics series, 03: 5-32. Berberian, M. and King, G. C. P., 1981- Towards a paleogeography and tectonic evolution of Iran. Canadian Journal of Earth Sciences, 18(2): 210-265. Byrne, D. E., Sykes, L. R. and Davis, D. M., 1992- Great thrust earth- quakes and aseismic slip along the plate boundary of the Makran subduction zone. J. Geophys. Res., 97: 449-478. Chen, Y., Wu, H., Courtillot, V. and Gilder, S., 2002- Larg N-S convergence at the northen edge Of the Tibetan plateau? New Early Cretaceous pale magnetic data from Hexi Corridor, NW China, J. of Earth and Planetary Science 201, pp.293-307. Coira, B., Kay, S. and Viramonte, J., 1993- Upper Cenozoic magmatic evolution of the Argentine Puna – A model for changing subduction eometry. Int. Geol. Rev., 35, 677–720. Cox, K. G., Bell, J. D. and Pankhurts, R. J., 1979- The interpretation of igneous rocks . George Allen and Unwin., 450 pp. Davidson, J. P., Ferguson, K., Colucci, M. and Dungan, M., 1988- The origin and evolution of magmas from the San Pedro-Pellado Volcanic Complex, S. Chile: Multicomponent sources and open system evolution. Contr. Miner. Petrol., 100, 429–445. Dupuy, C. and Dostal, J., 1978- Geochemistry of calc-alkaline volcanic rocks from southeastern Iran(Kouj-e-Shahsavaran). Journal of Volcanology and Geothermal Reasearch, 4: 363- 373. Ellam, R. M., 1992- Lithospheric thickness as a control on basalt geochemistry. Geology,20(2): 153-156. Ewart, A., 1982- The mineralogy and petrology of tertiary Recent orogenic volcanic rocks: with special reference to the and esitic-basaltes:com-positionalvange.In Andesites:orogenic and esitesandrelated rocks, R.S. Thorpe led.,26-87. Chichester: wily. Farhoudi, G. and Karig, D. E., 1977- Makran of Iran and Pakistan as an active arc system. Geology, 5: 664-668. Furman, T., 2007- Geochemistry of East African Rift basalts: An Overview. Journal of African Earth Sciences, 48, 147 – 160. Glennie, K. W., Hughes Clarke, M. W., Boeuf, M. G. A., Pilaar, W. F. H. and Reinhardt, B. M., 1990- The Geology and Tectonics of the Oman Region. Geological Society of London Special Publication, 49: 773- 786. Hildreth, W. and Moorbath, S., 1988- Crustal contributions to arc magmatism in the Andes of Central Chile. Contr. Miner. Petrol., 98, 455–489. Irvine, T. N. and Baragar, W. R. A., 1971- A guide to the chemical classification of the common volcanic rocks. Canadian Journal of Earth Science, 8(5): 523-548. Jung, D., Keller, J., Khorasani, R., Marcks, C., Baumann, A. and Horn, P., 1983- Petrology ofthe Tertiary magmatic activity the northern Lut area, East of Iran. Geological Survey of Iran, Tehran, Report 51, 519 pp. Karimpour, M. H., Malekzadeh Shafaroudi, A., Farmer, G. L. and Stern, C. R., 2012- Petrogenesis of granitoids, U-Pb Zircon geochronology, Sr-Nd isotopic characteristics and important occurrence of Tertiary mineralization within the Lut block, eastern Iran. Journal of Economic Geology, 4(1): 1-27. Karimpour, M. H., Stern, C. R., Farmer, L., Saadat, S. and Malekezadeh, A., 2011- Review of age, Rb-Sr geochemistry and petrogenesis of Jurassic to Quaternary igneous rocks in Lut block, eastern Iran. Geopersia, 1(1):19-36. Kay, S., Maksaev, V., Mpodozis, C., Moscoso, R. and Nasi, C., 1987- Probing the evolving Andean lithosphere; Midlate Tertiary magmatism in Chile (29– 30.5!S) over the zone of subhorizontal subduction. J. Geophys. Res., 92, 6173– 6189. Kay, S., Mpodozis, C., Ramos, V. A. and Munizaga, F., 1991- Magma source variations for mid-Tertiary magmatic rocks associated with a hallowing subduction zone and a thickening crust in the Central Andes (28–33!S). In: Andean Magmatism and its Tectonic Setting, Boulder, Colorado (R.S. Harmon and C.W. Rapela, eds). Spec. Pap. Geol. Soc. Am., 265, 113–137. Kopp, C., 2000- Structure of the Makran subduction zone from wide angle and reflection seismic data. Tectonophysics, 329: 171- 191. Kurkcuoglu, K., Furman, T. and Hanan, B., 2008- Geochemistry of post-collisional mafic lavas from the North Anatolian Fault zone, Northwestern Turkey, Lithos 101, 416-434. Kuscu, G. G. and Geneli, F., 2010- Review of post-collisional volcanism in the centralAnatolian volcanic province (Turkey), with special reference to the Tepekoy volcaniccomplex. International Journal of Earth Sciences, 99(3): 593-621. Le Bas, M. J., Le Maitre, R. W., Streckeisen, A. and Zanettin, B., 1986- A chemicalclassification of volcanic rocks based on the total alkali-silica diagram. Journal ofPetrology, 27(3): 745-750. Leeman, W., 1983- The influence of crustal structure on compositions of subduction- related magmas. J. Volcanol. Geotherm. Res., 18, 561–588. MacDonald, R., Hawakesworth, C. J. and Heath, J., 2000- The lesser Antilles volcanic Chine: a study in arc magmatism. Earth Science Review, 49(1-4): 1-76. Mattsson, H. B. and Oskarsson, N., 2005- Petrogenesis of alkaline basalts at the tip of apropagating rift: Evidence from the Heimaey volcanic centre, south Iceland. Journal ofVolcanology and Geothermal Research, 147(3- 4): 245–267. McCall G. J. H., 1997- The geotectonic history of the Makran and adjacent areas of southern Iran, Journal of Asian Earth Sciences, 15, 517-531pp. McCall, G. J. H., 2002- A summary of the geology of the Iranian Makran. In: Clift, P.D., Kroon, D., Gaedicke, C. & Craig, J. (eds). The Tectonic and Climatic Evolution of the Arabian Sea Region, 195. Geological Society, London, Special Publications, 147-204 pp. McMillan, N., Davidson, J. P., Wörner, G., Harmon, R., Moorbath, S. and Lopez- Escobar, L., 1993- Influence of crustal thickening on arc magmatism: Nevados de Payachata volcanic region, Northern Chile. Geology, 21, 467–470. Meshesha, D. and Shinjo, R., 2007- Crustal contamination and diversity of magma sourcesin the northwestern Ethiopian volcanic province. Journal of Mineralogical and Petrological Sciences, 102(5): 272-290. Moharami, F., Azadi, I., Mirmohamadi, M., Mehdipour Ghazi, J. and Rahgoshay, M., 2014- Petrological and Geodynamical Constraints of Chaldoran Basaltic Rocks, NW Iran: Evidencefrom Geochemical Characteris. Iranian Journal of Earth Sciences, 6(1): 31-43. Mullen, E. D., 1983- MnO/TiO2/P2O5: A minor element discriminate for basaltic rocks of environment and its implication for petrogenesis. Earth and Planetary Science Letters 62, 53 – 62. Pang, K. N., Chung, S. L., Zarrinkoub, M. H., Khatib, M. M., Mohammadi, S. S., Chiu, H. Y.,Chu, C. H., Lee, H. Y. and Lo, C. H., 2013- Eocene–Oligocene post-collisional magmatism in the Lut–Sistan region, eastern Iran: Magma genesis and tectonic implications. Lithos, 180- 181: 234–251. Pearce, J. A., 1983- Role of sub-continental lithosphere in magma genesis at active continental margins. In: Hawkesworth C J, Norry MJ (edt) Continental basalts and mantle xenoliths. Shiva Geology. Series, Nantwich, 29, 230-272pp. Pearce, J. A. and Cann, J. R., 1973- Tectonic setting of basic volcanic rocks determined using trace element analyses. Earth Planetary Science Letters 19, 290 – 300. Pearce, J. A. and Peate, D. W., 1995- Tectonic implication of the composition of volcanic arcmagmas. Annual Review of Earth and Planetary Sciences, 23: 251-285. Perugini, D. and Poli, G., 2012- The mixing of magmas in plutonic and volcanic enviroments:Analogies and difference. Lithos, 153: 261- 227. Reichew, M. K., Saundres, A. D., White, R. V. and Ukhamedov, A. I., 2005- Geochemistry andPetrogenesis of Basalts from the west Sibrian Basin, an extention of the Permo-TriassicSibrian Traps, Russia. Lithos 79(3-4): 425-452. Richards, J. P., Spell, T., Rameh, E., Razique, A. and Fletcher, T., 2012- High Sr/Y magmas reflect arc maturity, high magmatic water content, and porphyry Cu ± Mo ± Au potential:examples from the Tethyan arcs of central and eastern Iran and western Pakistan. Economic Geology, 107(2): 295–332. Rudnick, R. L. and Gao, S., 2003- Composition of the continental crust. In: R.L. Rudnick (Editor), Treatise in Geochemistry, Volume 3.Elsevier-Pergamon, Oxford, pp.1-64. Saadat, S. and Stern, C. R., 2011- Petrochemistry and genesis of olivine basalts from small monogenetic parasitic cones of Bazman stratovolcano, Makran arc, Southeastern Iran, Lithos, Vol. 125, pp. 607-619. Saccani, E., Delavari, M., Beccaluva, L. and Amini, S., 2010- Petrological and geochemical constraints on the origin of the Nehbandan ophiolitic complex (eastern Iran): Implication for the evolution of the Sistan Ocean. Lithos, 117(1-4): 209–228. Schandl, E. S. and Gorton, M. P., 2002- Application of high field strength elements to discriminate tectonic setting in VMS environment. Economic Geology, 97(3): 629-642. Shervais, J. W., 1982- Ti-V plots and the petrogenesis of modern and ophiolite lavas. Earth and Planetary Science Letters, 57, 101-108pp. Sirvastava, R. K. and Singh, R. K., 2004- Trace element geochemistry and genesis of Precambrian sub- alkaline mafic dikes from the central Indian craton: evidence for mantle metasomatism. Journal of Asian Earth Sciences, 23(3):373- 389. Smith, E. I., Sánchez, A., Walker, J. D. and Wang, K., 1999- Geochemistry of mafic magmas in the Hurricane Volcanic field, Utah: implications for small- and large scale chemical variability of the lithospheric mantle. Journal of Geology, 107(4): 433–448. Soesoo, A., 2000- Fraction crystallization of mantle derived melt as mechanism for some I type granite petrogenesis, an example from Lachlan fold belts. Journal of the geological Society, 157(1): 135-149. Stocklin, J., 1968- Structural history and tectonics of Iran, a review. AAPG Bulletin, 52, 7: 1229-1258. Stocklin, J., 1977- Structural correlation of the Alpine range between Iranian central Asia. Memoire ivors-serve No 8 dela societe Geologigue de France., 8, 333-353. Sun, S. S. and McDonough, W. F., 1989- Chemical and isotopic systematic of ocean basalts: implications for mantle composition and process. In: A. D. Saunders and M. J. Norry(Editors), Magmatism in the ocean basins. Geological Society, London, pp. 313–345. Takanashi, K., Shuto, K. and Sato, M., 2011- Origin of Late Paleogene to Neogene basalts and associated coeval felsic volcanic rocks in Southwest Hokkaido, northern NE Japan arc: Constraints from Sr and Nd isotopes and major and trace-element chemistry. Lithos, 125(1-2): 368–392. Ustunisik, G., Kilinic, A. and Nielsen, R. L., 2014- New insights into the processes controlling compositional zoning in plagioclase. Lithos, 200-201: 80-93. Winter, J. D., 2001- An introduction to Igneous and metamorphic petrology. Prentice Hall,New Jersey,796 pp. Wu, F. Y., Walker, R. J., Ren, Z. W., Sun, D. U. and Zhou, X. H., 2003- Osmium isotopic constraints on the age of lithospheric mantle beneath northeastern China. Chemical Geology, 196(1- 4): 107–129. Yang, W. and Li, S., 2008- Geochronology and geochemistry of the Mesozoic volcanic rocks in Western Liaoning: Implications for lithospheric thinning of the North China Craton. Lithos, 102(1-3): 88–117. Zarifi, Z., 2006- Unusual subduction zones: Case studies in Colombia and Iran. Ph.D. Thesis, University of Bergen.